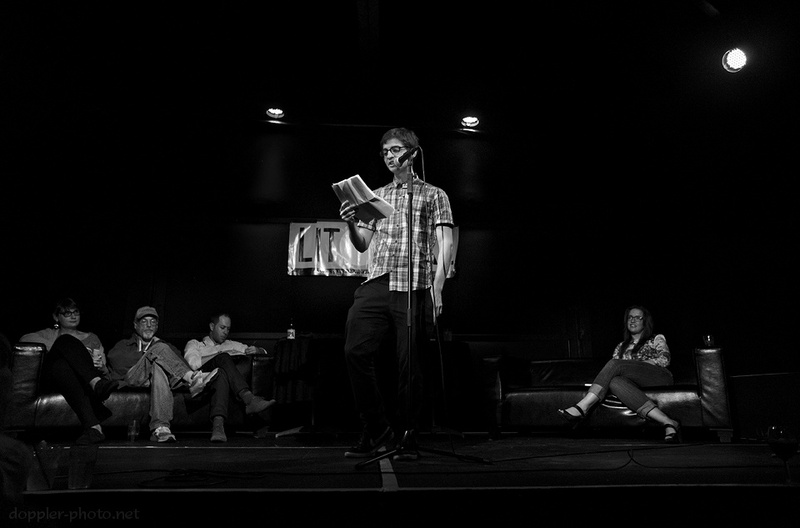 This past week, LitQuake invaded San Francisco for a week of literary mayhem. On the advice of a friend of mine, I attended Literary Death Match this past Thursday. 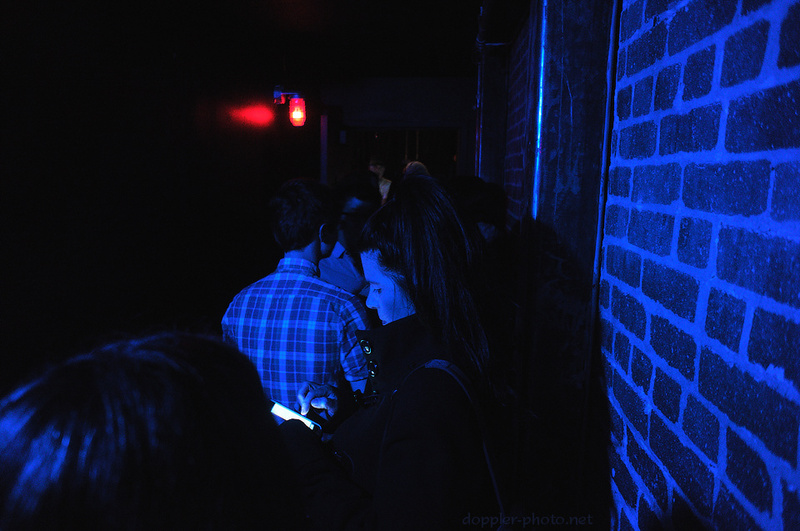 As I stood in line in the long, blue-tinged hallway leading to the "arena" of Beatbox, SF, I had no idea what to expect. My utter confusion would remain through the end of the event, to be joined at intervals by bouts of euphoria, melancholy, surprise, and a host of other emotions as the combatants shared and performed their pieces. Literary Death Match is the brainchild of emcee Adrian Todd Zuniga, and its premise is simple. Four authors have up to 8 minutes apiece to present their works in a single-elimination bracket competition. A panel of three judges determines the finalists, based on some combination of literary merit (Adam Mansbach, 3rd from left), performance (D.A. Powell, 2nd from left), and "intangibles" (Caitlin Gill, far left). 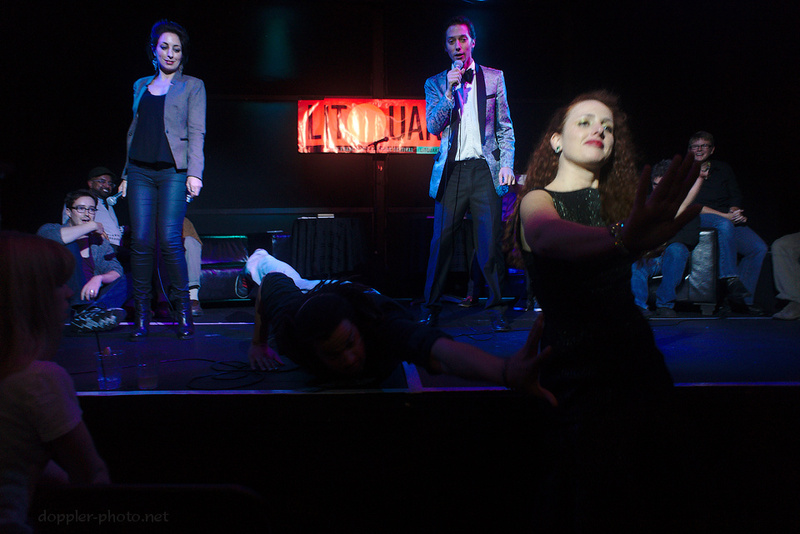 In the photo, Simon Rich presents a piece in the first round as his competitor, Amelia Gray (far right), watches and waits for her turn to take the stage. But in the finals, things got weird. The audience was divided, and each half belonged to one of the finalists. The DJ played a sequence of somehow-literature-related songs, and the first person to tag the hand of executive producer Alia Volz had an opportunity to guess the song and score a point for the team. Here, unbeknownst to to Volz, finalist Tim "Toaster" Henderson makes a dive, but too late, as she extends her hand away from him and toward another respondent. 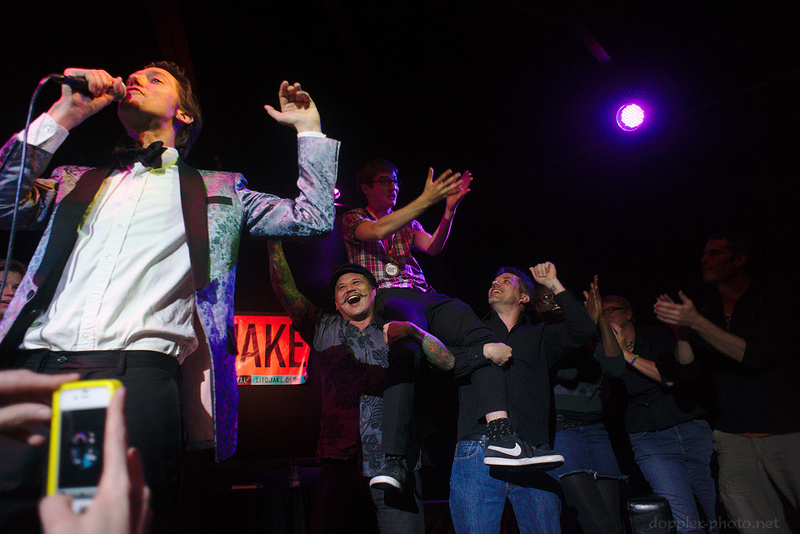 After some confusion about the specific version of the recording, a member of Toaster's team won the point by reciting the performers for four or five different potential versions of that song. Phew! Score one for the good guys. 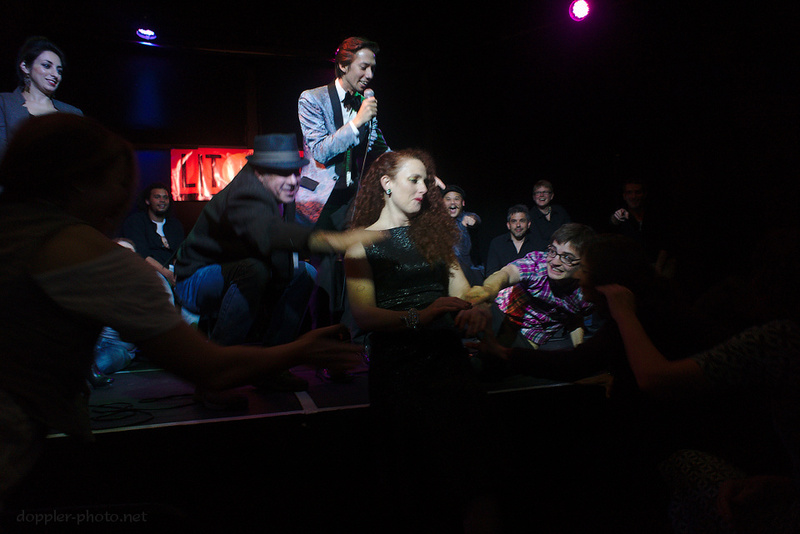 Volz is practically mobbed during a well-known song as Simon Rich makes a successful diving grab for her hand. Beyond the fact that Rich is clearly a copy-cat, that dive was totally uncalled-for, and his team had no right to be in the lead anyway. I mean, seriously, come on: what kind of person doesn't like a toaster?